Rutgers Dance Marathon has raised funds and awareness for Embrace Kids Foundation since 2000, ultimately helping many families and children affected by cancer and blood disorders. Featured here are some of the children that Embrace Kids supports through their many services. Our 3 year old bilingual speaking daughter, Allison, was 2 when she was diagnosed with a brain tumor. It was one of the scariest moments in our lives, but we are truly grateful for the incredible progress Allison has made. She is an incredibly strong little girl. She loves to play, and she is very smart. 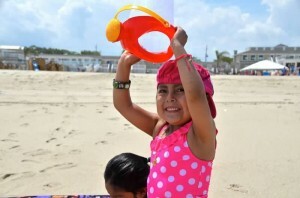 Allison and her older sister, Betsey, always have a good time with their cousins at the Embrace Kids events, especially the Beach Party. Allison also loves when her sorority sisters come to visit. We, as her parents, are also grateful for the Embrace Kids Spanish interpreter, Regina, since we are mainly Spanish speaking and only speak and understand a little bit of English. Everyone is so kind to us and does their best to find someone to make sure we understand what is going on, even if they are just playing with Allison. They even made sure to get an RU4Kids group that has Spanish speaking members. Our son, Nico, was diagnosed with a very rare disease, Evans Disease. His body destroys his cells, he doesn’t clot if he bleeds, and he has a compromised immune system. Along with the health challenges, we struggled to keep his life “normal”. Our primary goal was to keep our son’s outgoing personality and life normal. Embrace Kids stepped right up. If it weren’t for Embrace Kids events and parties, we would not have a social life. We have been lucky enough to be a part of the RU4Kids Program, pairing us with the Student Athlete Advisory Committee (SAAC). Every hospital or clinic visit we have, student athletes from SAAC visit him and make his day. Nico looks forward to coming to clinic so he can play with his “college friends” from Rutgers. Embrace Kids has given our family a chance to continue to make our son smile, and in the meantime they’ve changed our family. Savion was born with Sickle Beta-Thalessemia, a blood disorder. He requires constant treatment and will have it throughout his entire life. Savion has had multiple surgeries, and even more hospital stays. 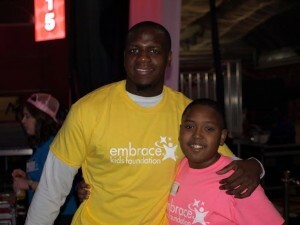 Embrace Kids has been there to assist Savion’s family financially, emotionally and spiritually. Savion loves to sing and dance. Almost every year he opens up the Rutgers Dance Marathon with a dance routine. He also loves being a part of the RU4Kids program, and has been paired up with the same group, Delta Chi, for a few years now. His family enjoys a great friendship with this fraternity. 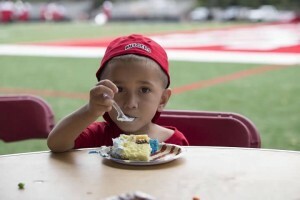 Savion and his family love the RU4Kids events, holiday parties, and Dance Marathon.